The 17th Annual golf tournament - Métivier Groupe Conseil Inc. 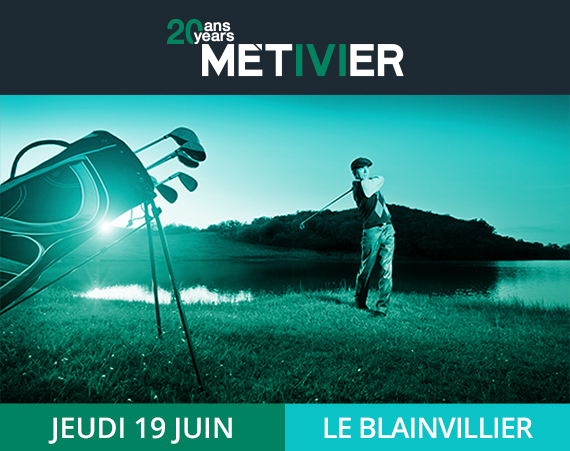 The 17th Annual Metivier Consulting Group golf tournament in support of Cystic Fibrosis Quebec is coming up soon. Your involvement in this event can take many shapes or forms: playing golf, offering a sponsorship, offering a gift for our evening draw, making a donation. Attached, you will find the registration form to be completed and to be returned as soon as possible. Fill out the registration form now, places are limited. Marie-Anne Fillion, our spokesperson for the past few years for this event, is a young 18 year old woman who has composed with the difficulties of having Cystic Fibrosis all her life. On February 7th 2013, she received a lung transplant. Last year she was among us once again for the tournament and touched everyone present with her story of how she faced the difficult months prior to her operation and the struggles of her rehabilitation. This year she will amaze you with her new found strength and energy. We are honored that Mr. Serge Desruisseaux, Vice President at the Laurentian Bank, accepted her invitation to preside our 17th edition. Hereby, in Marie-Anne and Mr. Desruisseaux’s name, we would like to invite you to join us on June 19th for a guaranteed great time! © 2019 Metivier Consulting Group Inc. All rights reserved. Please follow these simple steps in order to prepare adequately for your video shooting. 1. Write a short strategic text that describes you as a professional (your responsibilities, your areas of expertise, the industries you have experience in, your key skills, etc.) Make sure you finish by talking about your career goals. Ideally you should plan to read some of your text in French in your shooting to demonstrate your bilingualism. 2. Time yourself so that your text does not exceed the 1 minute and 30 seconds mark. 3. When you are satisfied with your text, please complete the following form. It should include strategic items in your speech that you would like to prioritise. These items will appear in your video to emphasise and animate your introduction. 4. Send us the final version of your text as well as the completed form to [email protected] The content will be validated within 24 hours. After receiving our acceptance email, our crew will contact you within 48 hours in order to schedule your video shooting session. 1. Please complete the following form to determine between 3 and 4 question you would like to answer in your video. Make sure you choose questions that will allow you to describe yourself as a professional and explain what your career objectives are. Ideally, if you are bilingual you should plan to answer some questions in French and other in English without exceeding the limit of questions. 2. When you are satisfied with your answers, complete the second part of this form. It should include strategic items you would like to prioritise for each of your answers. These items will appear in your video to emphasise and animate your introduction. 3. Practice your answers and make sure you do not exceed the 1 minute 30 seconds mark. 4. Send us the final version of your completed form at [email protected]obpourcadres.com. The content will be validated with 24 hours. After receiving our acceptance email, our crew will contact you within 48 hours in order to schedule your video shooting session. 5. During your shooting, you will address a member of our team who will play the role of the interviewer. There will be no visual aid, therefore, it is imperative that you master the content of each one of your answers in order to be comfortable and at your best. The more prepared you are the more your confidence and ease will be portrayed in the video. *Before you send us your text and your completed form, make sure that you have verified the contents thoroughly because Jobforboss.com will not be held liable for any grammatical or spelling mistakes that may appear on the video. If there are corrections to the content once the video is edited, additional charges of $25.00 minimum will apply. *You can cancel your shooting session if you do so in writing to [email protected] at least 48 hours prior to the appointment. If these conditions are not met an additional $50.00 charge will apply when the appointment will be rescheduled. *This rigorous preparation procedure and proven approach is set to ensure that the shooting session does not exceed a period of one hour. The shooting must be done efficiently. Thus, fees of $50.00 will be charged for every 30 minutes beyond the scheduled 60 minutes.